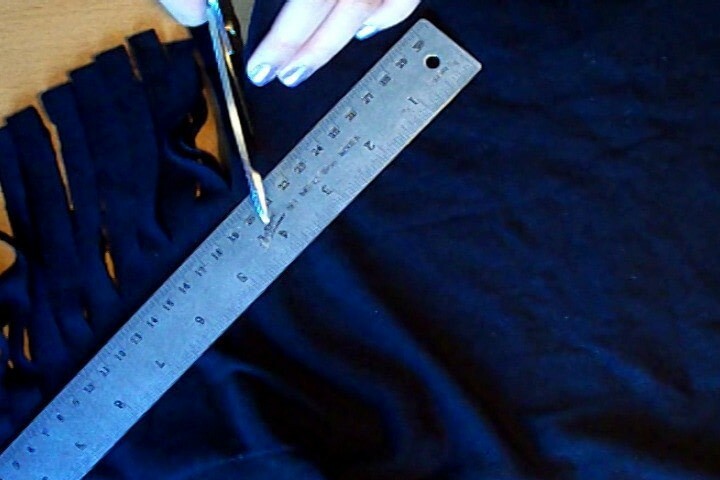 No sewing required, you just need a pair of fabric scissors. Cut the neck off - Follow the original seam so your cut will be even. 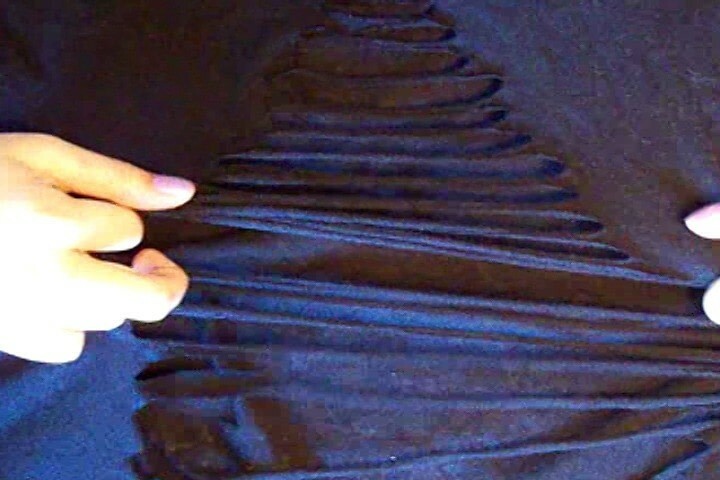 Cut 1in wider than the original neckline for a roundneck. Cut 1.5-2in wider than original neckline for a wide, boatneck or off the shoulder neckline. Fold the back of the shirt in half - Match up the shoulder seams so it is even. Decide the shape of the "V" that you want. The wider, or deeper the V, the sexier and more revealing the shirt. Use a rule to mark where you'll be cutting. Cut thin strips - about a finger width all the way down. 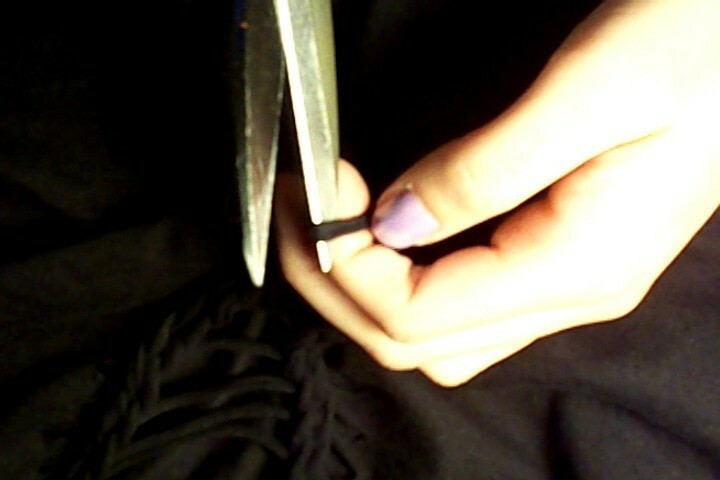 Careful not to cut too low or you'll have a hard time tying a knot in step 7. Stretch out the fabric to roll edges. Take each strip that you cut and pull it out so it turns into a thin and even strip. Weave - take the second strip and put it under and over the first strip. Still holding onto the second strip, take the third strip and place it under and over the second strip. Continue all the way to the bottom. Make sure you didn't miss any strips before doing the next step because you can still undo and redo the weave at this point. Knot - when you're holding onto the last loop at the very bottom of the V, take scissors and cut the loop in half. Double knot both of them to the previous loop to hold the weave. Done!!!!! You can repeat the weave if you like the look of having 2 or more weaves. See the difference compared to the main picture at the top? Try it out! 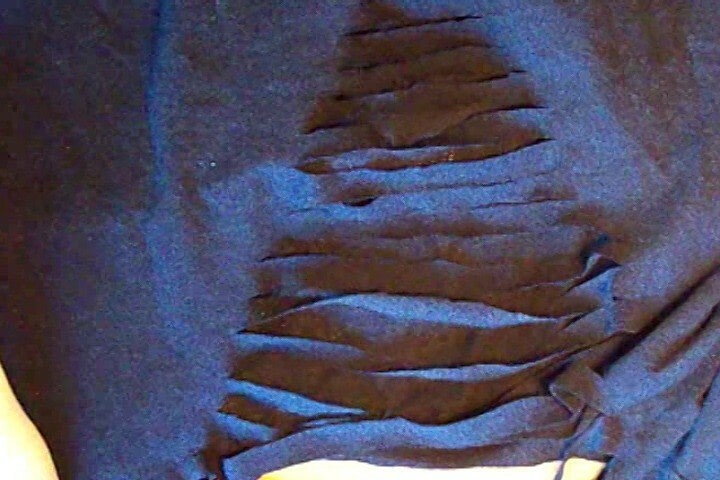 I just did this with an old long sleeve shirt I was going to throw away because it had holes in it. Turned it into a funky singlet and love it's new lease on life! Hey Everyone! Sorry I haven't gotten a chance to respond! For sizes, I think it would work on tight or loose t-shirts, the effect just comes out differently! Just finished this! Will be posting a version tomorrow! <3 Thanks for this fun tutorial. how do you do the braided look? What a great Idea! Gonna try that next summer! This is cute! Does the shirt survive a trip through the washer/dryer, or does it fray?